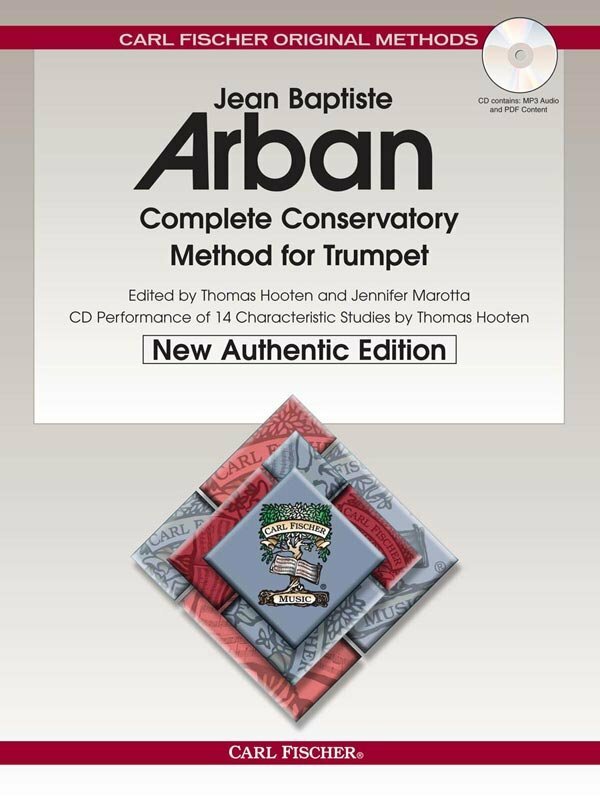 The New Authentic Edition of Arban’s Complete Conservatory Method contains the same tried and true comprehensive system of study that Arban developed over a century ago, and this completely re-engraved edition has been painstakingly edited by prominent trumpet performers and teachers. In re-editing the method, the Arban system has been kept intact, while adding some of editors’ own insights with respect to how trumpet is taught today. Purists and modernists alike will welcome these new editions. Arban’s time-tested pedagogical sequence has also been given a fresh new layout for easier reading. As an added bonus, the enclosed CDs contain spectacular performances of all of the 14 Characteristic Studies as well as piano accompaniments for the Fantasies performed by John Walker. All tracks are in MP3 format and can be downloaded to your desktop or MP3 player/iPod. The CD also contains the original text from the first edition of the Arban method in PDF form, including multi-language translations. The Arban Complete Conservatory Method is the definitive must-have for all trumpet players. With this masterful new edition and all of its extra resources, the Arban will remain the driving force in brass education for generations to come. Essential Elements for Band offers beginning students sound pedagogy and engaging music, all carefully paced to successfully start young players on their musical journey. EE features both familiar songs a nd specially designed exercises, created and arranged for the classroom in a unison-learning environment, as well as instrument-specific exercises to focus each student on the unique characteristics of their own instrument. EE provides both teachers and students with a wealth of materials to develop total musicianship, even at the beginning stages.